The accommodation here is over five floors, with a total of 260 air-conditioned rooms divided into standard, superior and suites. From the ground to the fourth floor, you’ll enjoy a variety of garden/golf course or sea views. On the fifth floor, the larger superior rooms and suites have even better vistas. All rooms are designed to accommodate two adults and one child. They all boast spacious bathrooms, walk-in showers, large bathtubs, with plenty of mirrors and marble. Rooms have a mini bar, tea/coffee maker, satellite TV, hairdryer, safe, telephone, even bathrobes and slippers. 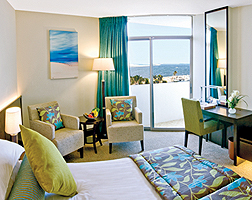 Both the Sea or Garden View rooms have light, modern interiors with a small balcony. There’s a choice of king or twin beds. These are the rooms that are a good family option. Superior Garden View rooms are twice the size, and have two balconies. These rooms offer complimentary access to the Peacock Lounge facilities on the fifth floor. Here, you’ll get a free newspaper, refreshments, snacks and fruit, continental breakfast, afternoon tea, pre-dinner drinks and DVD rental.